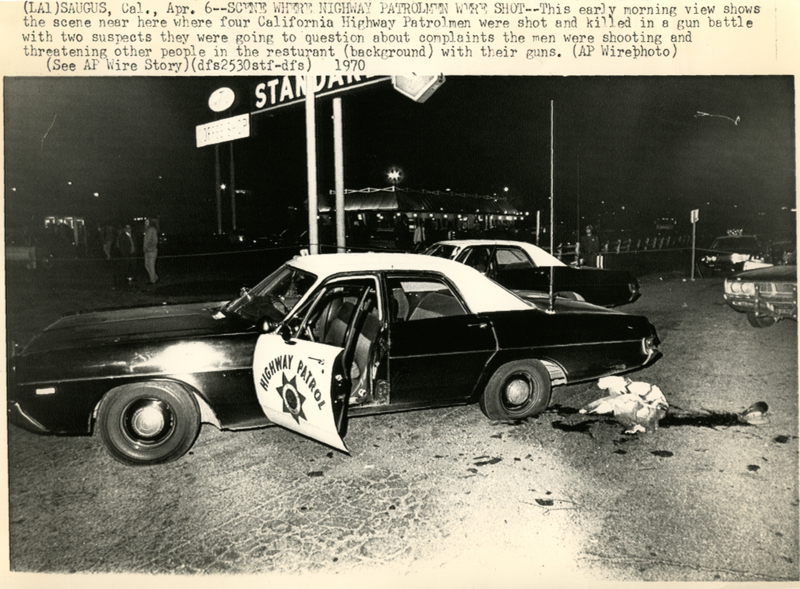 SCVHistory.com AL1970 | Law Enforcement | The Newhall Incident, April 1970. (LA)SAUGUS, Cal., Apr. 6--SCENE WHERE HIGHWAY PATROLMEN WERE SHOT--This early morning view shows the scene near here where four California Highway Patrolmen were shot and killed in a gun battle with two suspects they were going to question about complaints the men were shooting and threatening other people in the restaurant (background) with their guns. (AP Wirephoto). This early report isn't quite accurate. Actually, one the suspects had brandished a gun at another motorist after sideswiping the motorist's car on Highway 99 earlier that evening. See story below.